It is beyond all doubt that a society can only face the future and improve quality of life by generating new knowledge to develop new solutions or technological improvements to meet the major challenges we all face. At IBEC, frontier research is combined with specific transfer targets to produce new applied technologies to be used in life and health sciences. We have the versatility to generate excellent research and, at the same time, work with industry to develop new diagnostic or treatment systems. Early diagnosis, new therapies based on regenerative medicine, better quality of life compatible with an ageing population, and technological advances to increase efficiency and make healthcare sustainable: these are some excellent examples of areas where IBEC can contribute with its cutting-edge research to generate new technological advances of key importance to innovation. They are challenges which concern us because of their social and human repercussions, but also because they have a significant political and economic dimension. IBEC has the capacity to write many success stories on healthcare technology, nanomedicine and regenerative medicine, in the spheres of science, technology and innovation, success stories of which we will all be able to feel proud. IBEC was established in 2005 by the Ministries of Innovation, Universities and Enterprises and Health of the Generalitat de Catalunya (Autonomous Government of Catalonia), the University of Barcelona (UB) and the Technical University of Catalonia (UPC). Today, IBEC’s relationship with the UB and UPC researchers continues to operate under a framework agreement signed in 2008. 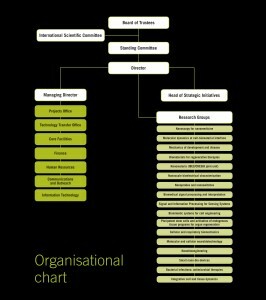 The institute currently has 21 research groups and 250 researchers and staff from 20 different countries. IBEC’s headquarters and most of its labs are located in the Parc Científic de Barcelona, which offers a highly stimulating biomedical environment in which the institute can work closely with organizations from the public and private sector interested in the biomedical application of nanotechnology. A few of IBEC’s labs are located at other sites, all of which provide the clinical, equipment or collaborative requirements specific to those groups. IBEC is part of a new wave of research initiatives set up in the last decade, with shared interests and points of view concerning how to advance the frontiers of knowledge in experimental science to benefit clinical and biomedical research. The common denominator shared by these new initiatives is their focus on the enormous challenge of how to make life science quantitative on any scale, taking full advantage of the unprecedented power of the convergence between nano, bio and ICT. 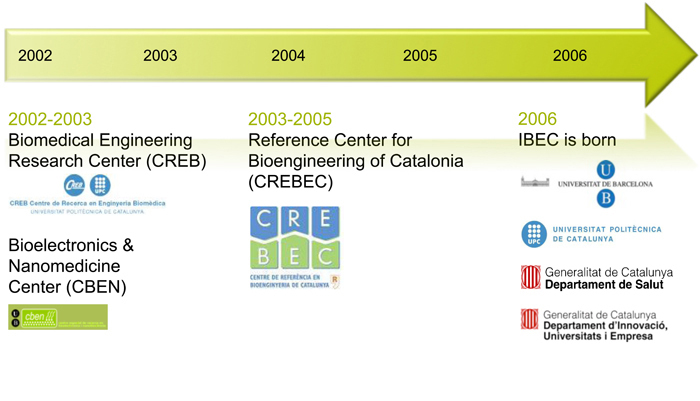 IBEC arose from the Centre of Reference for Biomedical Engineering of Catalonia (CREBEC), established in 2003 to coordinate the multidisciplinary research activities in biomedical engineering carried out in Catalonia. CREBEC was comprised of the Biomedical Engineering Research Centre (CREB) of the Technical University of Catalonia (UPC), the Research Centre on Bioelectronics and Nanobioscience (CBEN) of the University of Barcelona (UB) and the then newly created Laboratory of Nanobioengineering Research. IBEC was established in 2005 by the then Department of Innovation, Universities and Enterprises and the Department of Health of the Generalitat de Catalunya (Autonomous Government of Catalonia), the University of Barcelona (UB) and the Technical University of Catalonia (UPC). The governing body of IBEC is its Board of Trustees, composed of members of the four founding institutions. IBEC’s Board of Trustees receives advice from the director of the institute and from the International Scientific Committee. 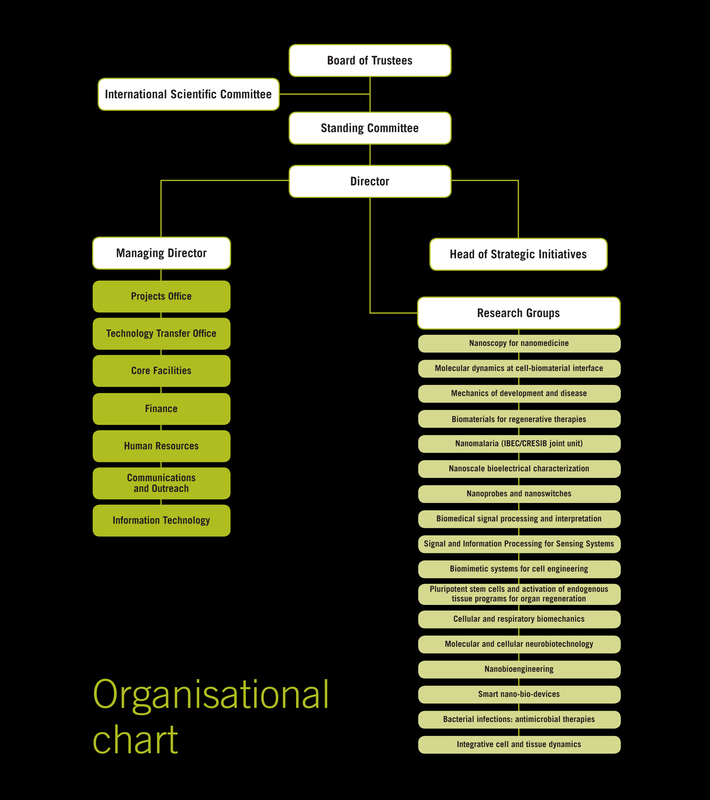 IBEC’s International Scientific Committee plays a key role in the activities of the institute, focusing especially on the selection and evaluation processes of the research group leaders. The committee is composed of international renowned scientists in different bioengineering fields, as well as prestigious professionals in key areas within the activities of IBEC, such as research results valorization or medical technologies validation.